Santiago is a young shepherd boy from Andalucia, who embarks on a journey to the pyramids in Egypt to find a treasure of his dreams. Through his travels, he meets interesting characters who both support his quest, which is dubbed his "Personal Legend," and challenge him. There is a strong spiritual and somewhat religious theme throughout about the universe coming together to support the quest for a Personal Legend. I have a hard time reviewing this book. It was a very quick read and the story flowed well. I enjoyed it. But it is such a simple fable. It was quite unrealistic, yet this story has evidently had a strong impact on people around the world, prompting them to reach for their dreams. I think this is definitely worth reading, especially since it's such an easy, quick read. It is a somewhat inspirational story, although it certainly hasn't changed my life. But it is a nice story about a boy achieving his dreams. This review was written based on a copy of The Alchemist that I purchased. This is a good book. Yes, simplistic in it's fable. 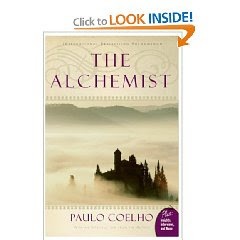 However, I highly recommend some of Coelho's other books. In particular, "I sat by the River Pidre and Wept", "The Witch of Portebella" and "The Devil and Miss Prynn" My spelling may be off on a few of these, typing from memory. All of his stories have a very heavy handing fable aspect but I really enjoyed those three as they are bit more complex than The Alchemist. Thanks for the recommendations! I will definitely check them out because I did enjoy his writing style and ideas, but I think I'd enjoy a little more complexity.